Lamba sensor wire doesn't need extending. Will not affect the MIL light. PLEASE BE AWARE THAT THIS ORIGINAL MODEL OF EVO 1 DESIGN MANIFOLD HAS NOW BEEN REDESIGNED FOR EXTRA FLOW AND POWER. THE RESULTING NEW DESIGN IS CALLED THE EVO 2 AND IS AVAILABLE EXCLUSIVELY FROM PUMASPEED AND ALL PUMASPEED OFFICIAL DEALERS. The EVO 2 Manifold made 3.5 bhp more afer 4500revs all the way to the top revs at 6900. An additional 7nm of torque was available from 3150 revs when fitted in conjunction with the Milltek Cat Back and Sport Catalyst and the Pumaspeed 182 remapping. After the huge success of the original 4-2-1 manifold design,Pumaspeed believed there was more to be had from this fantastic little pocket rocket. 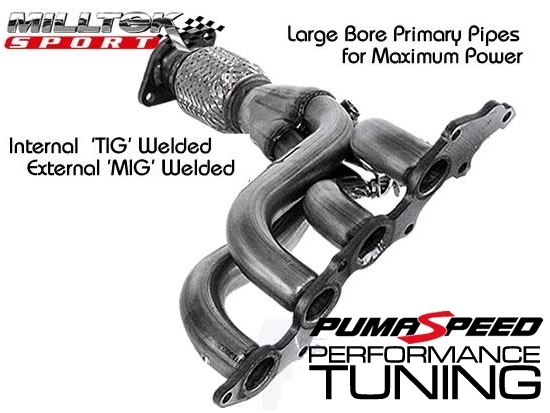 This is the result of the new design collaboration between Pumaspeed and MilltekSport, The 4-1 ?EVO? manifold with cosworth inspired primary pipes at 48mm in diameter has been dyno proved to cope with over 200bhp and deliver where others cant. Its all in the primary pipe specification.The correct length and diameter of the primary pipework of this manifold makes all the difference. Want Proof ? Check out the you tube video of a drag race between our st182 and the official ST185 from ford. A full car length head start and still the 182 pulls clear. Universal fit - any exhaust /cat or decat system standard ford or performance aftermarket. Increased rigidity - the picture shows a support bracket that stops flex high on the primary pipes that will eliminate cracking totally experienced by some stainless steel manifolds. Value - this item is less expensive to produce and therefore we can offer it at a lower price than the original 4-2-1 system. 1. Remove the original flexi. 2. Remove the lower gearbox stabilizer. 3. Remove the original manifold. 4. Support the engine front underneath (Beware the sump is fragile). 5. Remove the cam chain side engine mount and PS tank lid. 6. Pull the engine forward and down. 7. Expand the transmission tunnel heat shielding to allow for the 4 new headers. The Pumaspeed Workshop team are ready to fit the Milltek Sport ST150 EVO 4-1 Manifold in our Head Office located here. Therefore making parts and labour a total cost £462.31 (inc. VAT). Pumaspeed have a specialist distribution team that can dispatch the Milltek Sport ST150 EVO 4-1 Manifold to any destination worldwide.